Christian H. Reichardt, DC, has been a practicing Doctor of Chiropractic since 1983. He opened his first office in Malibu, California in 1984. Very early on in his career, Dr. Reichardt specialized in the evaluation and care of sports-related injuries and became one of the first certified chiropractic sports physicians in the United States. His abilities as a doctor and healer quickly drew a large clientele of Hollywood celebrities and professional athletes. Since then, he has turned his attention from sports injuries to wellness care, He has added many other accomplishments to his resumé, including involvement with several US Olympic teams, the PGA of America, and the United States Golf Fitness Association. He has written numerous articles for a number of golf magazines and websites. In 2001, he published the acclaimed book "Pain-free Golf", which became one of the best selling exercise books in the golf world and is now required reading material at several golf colleges. Having worked with over 12.000 patients during his career, Dr. Reichardt is uniquely positioned to understand the needs and requirements of his patients. Dr. Reichardt’s goal is always to help his patients graduate from pain to health, and then on to wellness. His approach combines the principles of chiropractic with soft tissue work, nutrition, counseling and lifestyle coaching into an effective healing approach. He now published his latest book "Staying in the Green Zone" to bring the information and guidance that has already helped thousands of patients to a broader audience. Staying in the Green Zone: How Biology Drives Behavior is a nonfiction motivational self-help book written by Dr. Christian Reichardt. Dr. Reichardt has been a practicing Doctor of Chiropractic for 35 years; he’s also a Certified Chiropractic Sports Physician since 1986, a Certified Master Golf-Club Fitter since 2005 and a Certified Yoga Instructor since 2000. In the first section of his book, he explains how our genes are wired for survival and how those instinctual reactions often keep people from achieving the dreams and goals they’ve all but given up on. While acknowledging the value of these evolutionary blind spots, he illustrates, in the second half of his book, how one can become aware of the Red Zones and transform one’s life into a Green Zone, making long-held dreams become accessible realities, and changing one’s focus from worry to actualities. Dr. Christian Reichardt’s nonfiction motivational self-help book, Staying in the Green Zone: How Biology Drives Behavior, is an easily accessible and well-written handbook for overcoming the self-limiting behaviors and mindsets most carry along with them in their everyday lives. His presentation is brilliant as exemplified in his chapter on the differentiation between decision and preference, which demonstrates how lacking the confidence to simply go with one’s preference, instead of being bogged down by indecisiveness, can strip the joy of something as simple as indulging in a treat. I followed his advice and resisted the impulse to skip to the second part and was glad that I did. The first part gave me a lot to think about and doing so prepared me for the exercises that followed each of the second half’s chapters. Reichardt gives the reader advice on nutrition, meditation and implementation of a fitness program suitable for one’s fitness level. He illustrates how to use self-discipline as a tool, and he shows how even a two-minute meditation session at one’s desk can result in big changes for the better. I especially liked the take-away questions he poses at the ends of the part two chapters. They reinforce the topics covered and help to make them personal for the reader. Staying in the Green Zone: How Biology Drives Behavior is most highly recommended. What does it mean to be in the zone? Being in the zone means being in the moment, whether it's mentally, physically or emotionally. Being in the zone exudes the right feeling. 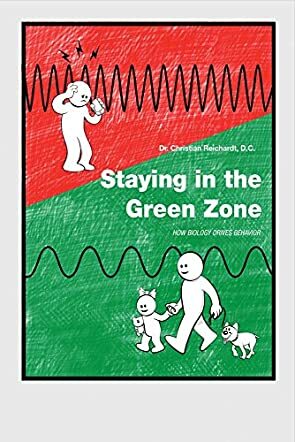 In this self-help book, Staying in the Green Zone: How Biology Drives Behavior by Dr. Christian Reichardt, you will be taught about the best steps and practices to get in and stay in to tap into the zone. Reichardt states that the red zone represents STOP. In this zone you will experience negative emotions from stress and anxiety to the lack of motivation, which can lead to depression or suicidal thoughts. On the other hand, Reichardt states that there is a green zone which represents GO. This is the zone where happiness, tranquility and balance reside. The reader will discover that within each chapter one will be challenged to read, review and answer various questions that will help one to channel their awareness and to get centered. This book is a great way to tap into your oneness, improve yourself, and to create a platform of becoming who you were meant to be; centered. To help you gain balance what you eat, drink and think is crucial, but incorporating forms of meditation, yoga, Pilates, mindfulness and a copy of this book adds yet another level of release. Through Reichardt’s practice, you will be able to obtain some of the beauty and hidden gems that Reichardt’s patients have had the opportunity to enjoy. As Reichardt states, getting into the green zone takes practice, but it can be done. There will be times when life’s challenges may throw you a curve ball, but with practice, practice and more practice, you will regain your center and get back into the green zone. To your health. Staying in the Green Zone: How Biology Drives Behavior by Dr. Christian H. Reichardt is a book for all those readers who want to improve their lives by making changes in their daily existence, but have not succeeded. Why is change so difficult? Although every person’s experience is different, deep down everyone has the same insecurities, struggles, fears, worries, joys, and pleasures. The author’s quest to find out why change is difficult, and his observations based on that, are shared in this book. The tools in the book help to make a significant shift permanently and will enable readers to move from their red zone to the green zone and remain there. Divided into two sections, the first section is about understanding why certain things are done and not done, and the second section gives information and practical advice about specific actions that will enable readers to make changes in life. The book is insightful and uplifting, and the tips and suggestions are simple and easy to incorporate into our lives. The author’s words are helpful in making readers look into themselves and see where they need to make changes for a fulfilling life. The personal stories in the book make the author’s experiences and words palpable. The diagrams are helpful when it comes to understanding the concept clearly. The author’s approach towards the topic is simple, and the real and tangible options he gives to readers make it easy for them to choose and decide what is best for them to enhance the quality of their lives. Staying in the Green Zone: How Biology Drives Behavior by Dr. Christian Reichardt is a self help guide to reducing stress and taking steps to improve one's health, targeting those who are stressed, anxious and overwhelmed, despite the many steps taken to reduce that stress whether it's through exercise or meditation. Reichardt first assures the reader that they are not alone as he recounts his own moments of mounting stress and failing health, and how he managed to turn that all around and go from the Red Zone of heightened anxiety to the Green Zone of ease and mindfulness. He starts off with a brief history of human evolution and how in our modern, fast paced society humans have not evolved to catch up. Once he lays out the nature of the problem, he offers helpful ways to manage it. Incorporating neuro-science as well as stories from real people, Dr. Christian Reichardt has created a succinct self help guide that encourages the reader to look inward at themselves and their perspective to get the relief they crave from stress. I thought Staying in the Green Zone by Dr. Christian Reichardt was pretty well written. Reichardt is not writing the book to sell the reader anything, and many of the tips he reveals offer a lot of food for thought on how our perspective shapes reality. All in all, Dr. Christian Reichardt is encouraging throughout, asserting that the life you want to live is within your reach and that the tools to get there are in your hands. I’m always looking to improve myself. I have read a lot of books in my effort to do this. Some of them are pretty good, most are them are mediocre, and a few I just couldn't get anything from. What I've found most important is that I really understand what I read and that I am diligent in applying what I have read in my everyday life. This is the hard part. You must keep working on it every day, step by step until the changes start to happen. I just finished reading Staying in the Green Zone: How Biology Drives Behavior by Christian H. Reichardt, DC. Modern stress is very different from the stress our ancestors faced. It is a powerful and enlightening message and I hope to apply it in my life and experience some good results. The first thing that appealed to me about Staying in the Green Zone is brevity. I read fast and roughly a hundred pages is not a major investment in time for me. After I started reading, the great, easy, conversational tone made it easy to keep going. Christian H. Reichardt is a great writer and everything he said made me want to learn more. Life is biology and we are part of the natural order. If we can figure out why we do things, it just makes sense that we might be able to make a better life for ourselves. Christian H. Reichardt has figured out a way to improve that life based on his training, experience, and observation. There are steps to take and procedures to learn but, as of now, it looks like it might be powerful and effective.